HealthDay News -- Months after concussion symptoms such as dizziness, headaches and memory loss fade, the brain continues to show signs of injury, a new study suggests. Comparing 50 concussion patients with the same number of healthy people, researchers found that the brains of those suffering concussions showed abnormalities four months later. This happened despite the fact that their symptoms had already eased to some degree. The findings may sway conventional thinking about when it's safe to resume physical activities that could produce another concussion, the study authors said. The nonprofit Mind Research Network (MRN) has partnered with the University of New Mexico (UNM) to introduce Brain Safe, an innovative, state-of-the-art sports-related concussion assessment program designed to study and minimize the impact of brain injury on NCAA athletes in contact sports. More than 200 UNM athletes will receive a noninvasive MRI scan of brain structure, chemistry, connectivity and function at the beginning every season. Every year, or after any acute injury, the athlete will be scanned again and the results will be compared to their initial baseline MRI. Using this ‘within-subject’ design, the athlete’s baseline MRI scans can be precisely compared to post-injury scans. Highly sophisticated MRI analyses will be performed using algorithms developed by MRN and UNM scientists to identify any brain related injuries. ALBUQUERQUE, NM--(Marketwired - Jul 22, 2013) - The Center for Biomedical Research Excellence (COBRE) at Mind Research Network (MRN), in partnership with the University of New Mexico, has received a grant worth $15 million to study mental illness, positioning the institute as leader in brain imaging. Similar to the goal of the National Institutes of Health (NIH) BRAIN Initiative, the grant seeks to use evolving neurotechnologies to better understand brain disorders. This award allows COBRE to expand its research on psychosis and mood disorders. The grant represents the second phase of the NIH Institutional Development Award (IDeA) funding for the Multidomal Imaging of Neuropsychiatric Disorders (MIND) study conducted by COBRE. Vince Calhoun, Executive Science Officer at MRN and Distinguished Professor of Electrical and Computer Engineering at UNM, will continue to lead studies on schizophrenia and expand his research to include more disease categories with a goal of gaining a better understanding of the neural and genetic mechanisms of psychosis and mood disorders. "The combination of state-of-the-art technology and tools to study the brain, novel interventions (e.g. brain stimulation) to study schizophrenia, bipolar disorder, and major depression and the involvement of interdisciplinary researchers from all over the world, will lead to new advances in our understanding of these very serious mental illnesses," Calhoun said. "This is a huge boon for the research and biotech community of New Mexico, and solidifies the Mind Research Network as a national leader in bringing a multi-disciplinary approach to unlocking the brain's mysteries," said Dr. Robert Rubin, CEO of the Lovelace Respiratory Research Institute, which is affiliated with MRN. "This grant will allow Dr. Calhoun and his team to break new ground in the field of mind research." The MIND COBRE study represents a collaboration of MRN researchers and the departments of Computer Science, Electrical and Computer Engineering, Math and Statistics, Neurology, Neurosciences, Psychiatry, Psychology at UNM. "Centers of Biomedical Research Excellence are thematic, multidisciplinary programs that develop faculty and institutional research capabilities in states that historically have had low levels of funding from the National Institutes of Health," said W. Fred Taylor, Ph.D., the IDeA program chief at NIH'S National Institute of General Medical Sciences. "This center developed a novel neuroimaging approach to study cognitive pathology in schizophrenia during the first 5 years of support. This next phase of support could lead to improved diagnosis and treatment of psychotic and depressive disorders." The MIND COBRE study is just one of many being performed at MRN, a nonprofit neurodiscovery center located on the UNM campus. The center was founded in 1998 has since become world-renowned bioscience institution. ALBUQUERQUE – Vince Calhoun, Ph.D., professor at the University of New Mexico and Executive Science Officer at the Mind Research Network (MRN) located in Albuquerque, recently received fellowship designations for both the American Association for the Advancement of Science (AAAS) and the Institute of Electrical and Electronics Engineers (IEEE). 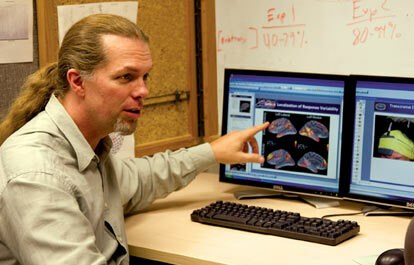 Dr. Calhoun’s research also examines the ways connections between regions of the brain are impaired during mental illness. Additionally, he has been a pioneer in the field of data fusion, a process that combines multiple complementary types of information such as brain function, brain structure and genetics to create a clearer image of the human brain. Calhoun’s achievements are not limited to the designations by AAAS and IEEE. He also recently earned the A. Earl Walker Neuroscience Research Award, which recognizes outstanding contributions to basic or clinical research in neuroscience by a member of the faculty in any UNM department. For more information on American Association for the Advancement of Science, visit http://www.aaas.org. And, for more information on the Institute of Electrical and Electronics Engineers, visit http://www.ieee.org. The Mind Research Network (MRN) is an independent non-profit organization dedicated to advancing the diagnosis and treatment of mental illness and brain injury. Headquartered in Albuquerque, New Mexico, MRN consists of an interdisciplinary association of scientists located at universities, national laboratories and research centers around the world and is focused on imaging technology and its emergence as an integral element of neuroscience investigation. MRN is affiliated with Lovelace Respiratory Research Institute. http://www.lrri.org; http://www.mrn.org. Future Tense Event Recap: Will Neurolaw Change the Judicial System—and Does Free Will Exist?